To celebrate its 100th anniversary, the National Park Service has launched the Find Your Park campaign. The Park Service is inviting Americans to discover parks near them. 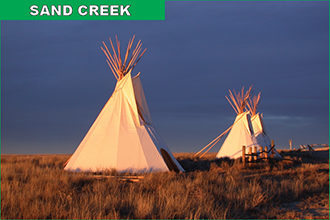 With this in mind, Sand Creek Massacre National Historic Site (NHS) in southeastern Colorado has partnered with Fort Larned National Historic Site (NHS) in western Kansas to link two national parks that share common bonds of turmoil during the Civil War and Indian Wars. Center in Eads, Colorado, for a free presentation titled "Fort Larned, Plains Indians and the Santa Fe Trail." 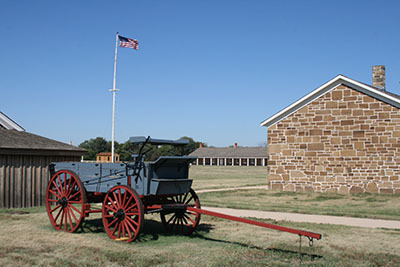 The one hour program starts at 5:00 p.m.
From 1859 to 1878, Fort Larned operated as one of many U.S. military posts along the Santa Fe Trail. The purpose of the fort was to protect the U.S. mail and other government/civilian transportation on the trail. From 1862 to 1868, Fort Larned also served as an Indian Agency for the Cheyenne and Arapaho. After his appointment in 1866 as a special Indian Agent to those two tribes, Edward Wynkoop, ex-Army officer and friend to the Cheyenne and Arapaho, established his agency at Fort Larned. Wynkoop was one of the few Indian Agents, who genuinely tried to make things better for the tribes. For additional information, please call the park at 719-729-3003 (Monday through Friday, 10 a.m. to 4 p.m.) or visit www.nps.gov/sand. Pictured: Historic wagon at Fort Larned. NPS Photo.